Classic designs with modern advancements work together in the new Odyssey Golf White Hot RX Blade Putters with SuperStroke Grips. Available in three blade-style heads, the #1, #2, and #9 putters use the same technologies as other members of the White Hot RX family to deliver fast, pure rolls with improved feel. 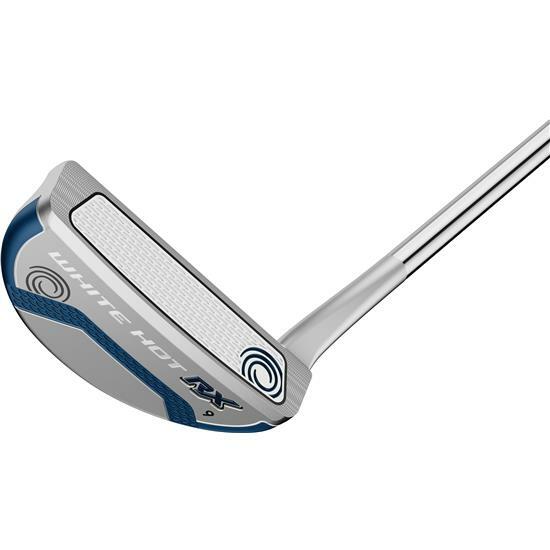 To push shots farther and faster than ever, Odyssey designed the RX Blade Putters with the same high-performance oval pattern insert as the Odyssey Metal-X and Odyssey Works families, to work in tandem with the White Hot insert. The unique oval pattern sits in an elastomer insert, which also features a texturized coating over the strike zone on the face to create more friction. The result of this feature combination? Smoother, faster rolls for any player. Over the past 15 years, players continually returned to the outstanding performance of Odyssey’s White Hot insert. Those same beloved features just got even better with the upgraded White Hot insert in the RX Blade Putters, thanks to an additional layer of an injected molded insert. This new double layer insert creates a softer core with firm outer that simultaneously softens feel while still maintaining roll speeds. The new White Hot RX insert also allows for better speed control, pushing balls into a smoother roll sooner in the shot. Thanks to the upgraded SuperStroke grip, the RX Blade Putters have better weighting balance. With a no-taper design, players also get a more even-pressured grip, helping generate more consistent strokes. Rounded heel-toe weighted blade head, with full-shaft offset and crank-neck hosel. Heel-toe weighted modified blade head with squared- off shaping, a flow neck hosel, and half-shaft offset. Toe-weighted blade with heel-shafted flange and half-shaft offset. You are about to post a review for Odyssey Golf White Hot RX Blade Putter with Super Stroke Grip based on your knowledge of its playability. This review will show up under all variations of Odyssey Golf White Hot RX Blade Putter with Super Stroke Grip, including new, personalized, and custom logo.